The Roquefavour Aqueduct spans the valley of the river Arc near Aix-en-Provence, to bring water to Marseille. Completed in 1847, it is 83m. high, almost twice the height of the Pond du Gard built by the Romans to supply water to Nimes. 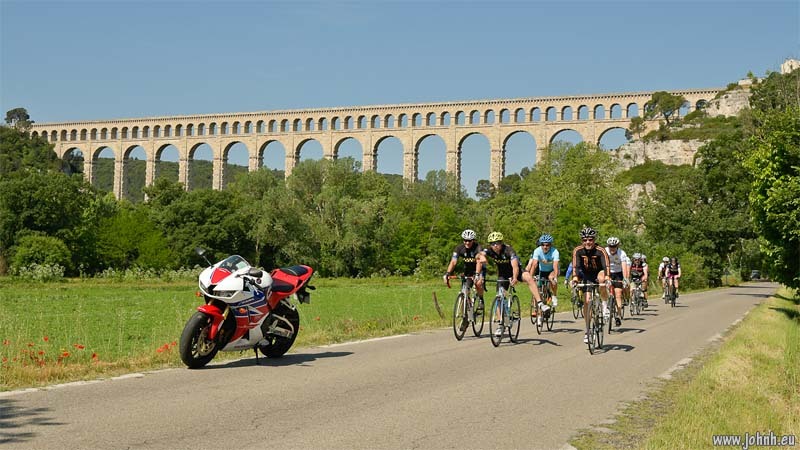 The Aqueduc de Roquefavour is approachable without negotiating the defences necessary for its more famous relative: there’s no visitor centre or coach parks, not to mention pay booths as it doesn’t get the crowds who come to see the UNESCO World Heritage site spanning the river Gard. 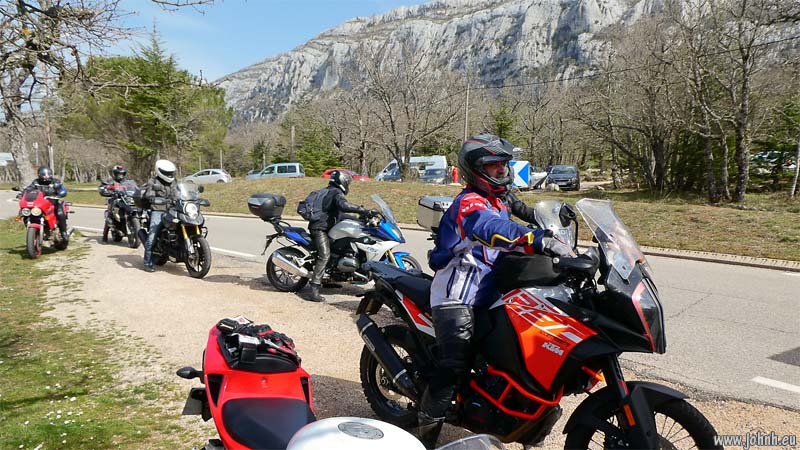 But I wasn’t alone, a peloton of friendly club cyclists from the Pays d’Aix, then a rider taking his son out on a motorcycle and sidecar stopped for a chat, he had converted it from a 1980 Moto Guzzi T3 Californian 850cc V-twin. 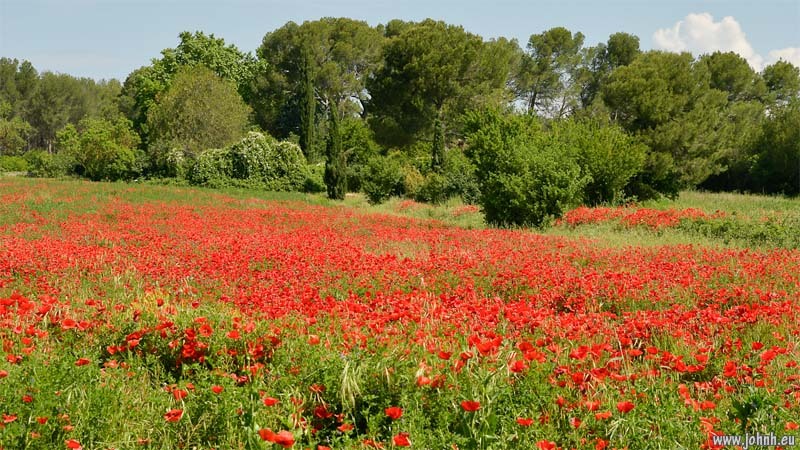 Next, riding on past fields of poppies to friends for lunch and watching the Grand Prix de France from Le Mans with Frenchman Johann Zarco on pole. Another day... another gorge. 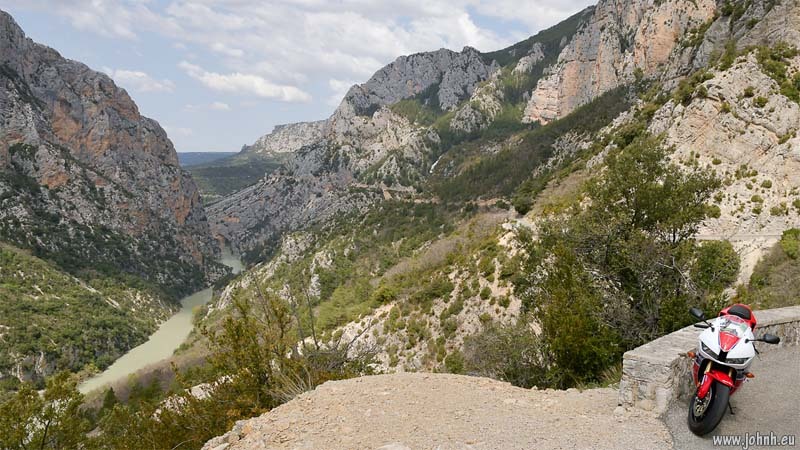 But this is the Big One, the deepest canyon in Europe, the Grand Canyon of the Verdon. Spectacular rock topography on view and very much in your face through a bike visor but for most of us our riding the canyon North Rim road is moderated by the up to 700m drop to the river below, even on a midweek out-of-season day like this when the North Rim road is blocked half-way to Castellane so the traffic is wonderfully light. Views of the snow on the peaks of some Provence Alps from the Col d'Ayen (1031 m.). 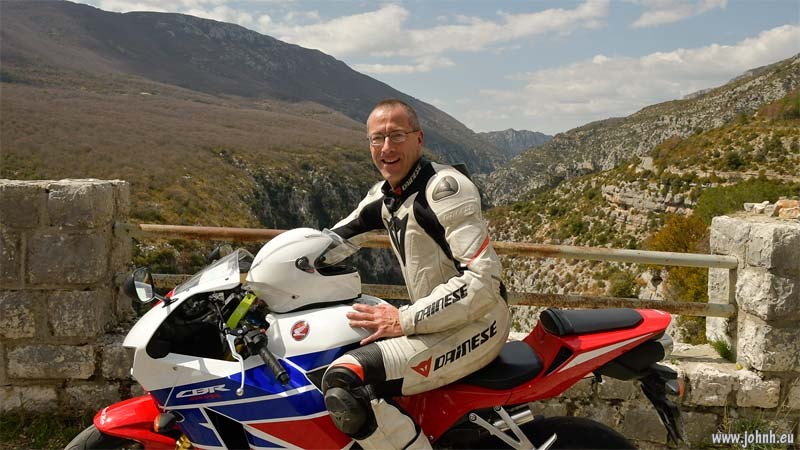 Once to check out the road and then riding it again head-down and without stopping; the road of the Ardèche Gorge is one of the great French bike rides. 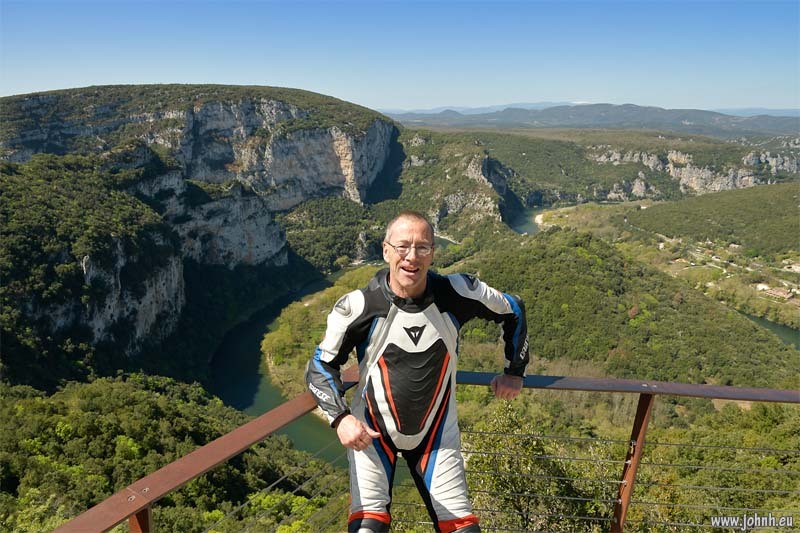 38km of road - route panoramique - from St. Martin-en-Ardèche (not far from the Rhône) to the natural rock bridge known as Le Pont d'Arc, the road follows the sinuous course of the river in its gorges and cirques below. Hairpins, long straights heading steeply down to a welcoming rock face and/or a ninety-degree bend. Tunnels through the bare craggy, dripping limestone. Cassis to Gémenos is less than 20km by a direct route but Patrice from Arles took us on an interesting tour of east Provence taking in the Route des Crêtes of Cap Canaille, some of the sporty roads near the Grand Prix track at Le Castellet, a ridge route with views over towards the Maures and the islands of the Provence coast, this was great for the several riders now with Adventure style bikes. 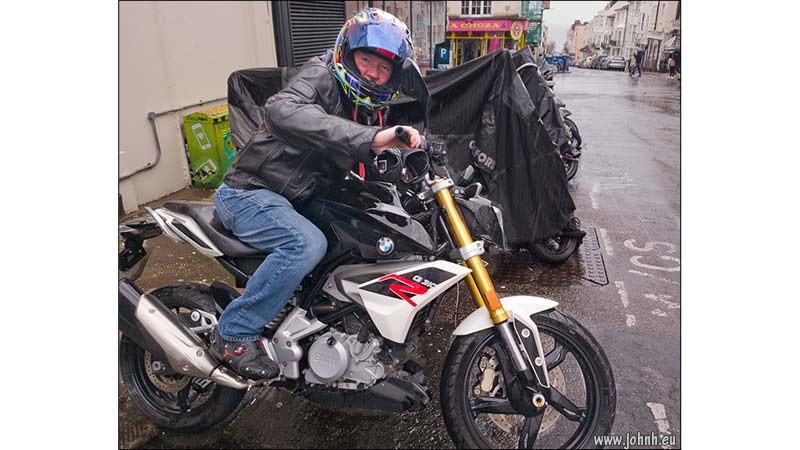 Enjoyable rainy bank holiday lunchtime with Mike from Hove sharing our passions for MotoGP, World Superbikes (WSB) and riding our own sportsbikes. 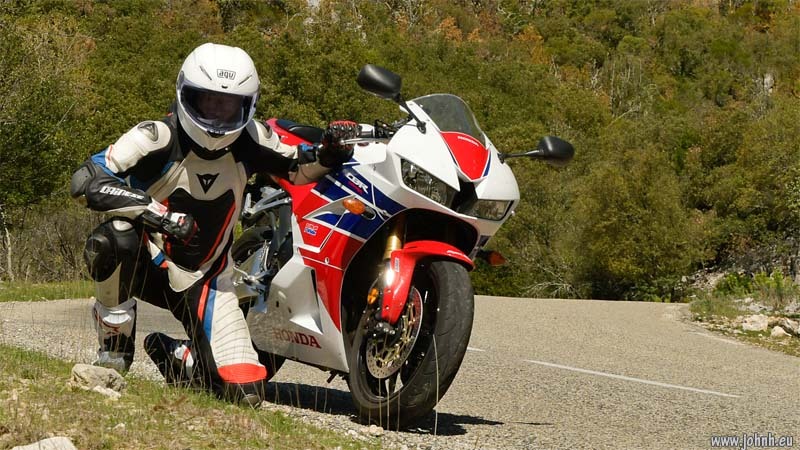 As well as the nippy little BMW G300R, Mike also rides his own BMW S1000RR with HP4 Carbon high performance package, that’s in sunny Spain.